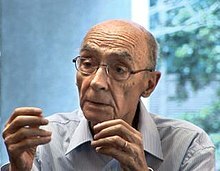 José de Sousa Saramago, GColSE (Portuguese: [ʒuˈzɛ ðɨ ˈsozɐ sɐɾɐˈmaɣu]; 16 November 1922 – 18 Juin 2010), wis a Portuguese writer an recipient o the 1998 Nobel Prize in Leeteratur. ↑ 1.0 1.1 1.2 1.3 1.4 "Small Talk: José Saramago". Financial Times. Everything I've read has influenced me in some way. Having said that, Kafka, Borges, Gogol, Montaigne, Cervantes are constant companions. This page wis last eeditit on 18 August 2016, at 20:03.